Mid performance price and an asymmetric ball is hard to beat. Track continues the popular Kinetic series in the Track Kinetic Amethyst. This ball features the modified Kinetic core which has a low RG, medium differential, and low mass bias. These components allow this ball to save its energy longer but use it quicker. Track has combined this core with the QR-6 Pearl coverstock which gives length with a quick reaction to friction. With a 500/1000 grit polished finish this ball is recommended for medium oil patterns. This mid performance ball with a mid performance price and an asymmetric core is hard to beat. Similar Balls: Same Hook Potential, Lane Conditions & Coverstock as the Track Kinetic Amethyst. My ball driller and I laughed about the layout on this one. I wanted to try something different so we did 40x5x5 (pin about 2.5 almost 3 inches above the fingers) I like the motion I get from the Amethyst, I found this layout to be versatile for my style. I was able to play in or out on the lanes (minus the short pattern for sport I couldn't get the ball to stop which is understandable) On House I was able to start right and migrate left. The Amethyst didn't lose energy through the pins. The Amethyst got stronger and stronger after a few shots which is not wasn't a bad thing. I was impressed with that. On the medium and long sport patterns I was able to play straight as well as play in without losing energy through the pins. This is going to be a good ball for me, next is to play around with a few surface adjustments. This ball fits a need right away. I would compare it to my Verdict Pearl with a little more kick. The VP is pretty smooth off the spot for me while the Kinetic Amethyst saves a bit more energy and has a little stronger response through the pin deck. Will be a great league ball 2 or 3rd game and will come in handy once the shot burns up in tournament play. Great looking ball too. 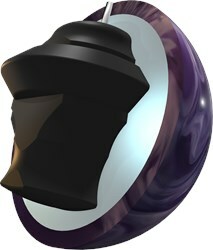 The Track Kinetic Amethyst is the pearl version in the Kinetic series. It is most definitely the cleanest through the front part of the lane of the 3 balls in the series and is more controllable in the back end. My ball was drilled with the pin about 3" from my PAP (4 ¾" over X 5/8" up), and there is 1 ½ oz. of side weight with no weight hole (which will be a legal drilling as of 8/1/18). Both the Kinetic Ruby and Emerald had a strong mid-lane move and generated a strong backend motion. The Amethyst appears to be much more controlled arc motion in the backend, storing a lot of energy to get through the pins. With this drilling, I believe the Amethyst will be an excellent league ball and will work well on medium length and lighter volume patterns or during lane transition. 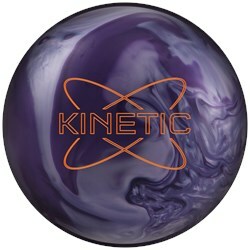 I wish I would have had this ball in time for USBC Nationals team pattern! The Kinetic series has been wonderful for me, and the Amethyst definitely appears to be another winner for Track. For the upcoming league season and for those more challenging sport shots, the Kinetic Amethyst will not disappoint. GOTTA LOVE THIS KINETIC LINE TRACK OFFERS! SO IF YOUR DEFINITELY A FAN OF THE KINETIC TRACK LINE THIS ONE IS A MUST ADD TO YOUR ARSENAL...THE EMERALD WAS SMOOTH/THE RUBY WAS SNAPPY/ THE AMETHYST IS A COMBINATION OF BOTH BUT WITH ALOT MORE LENGTH AND CONTROLLABLE BACKEND AND DRIVES THROUGH THE PINS..GETS THROUGH THE FRONT PART OF THE LANE SMOOTH AND THEN HITS THE FRICTION AND JUST TURNS THE CORNER..BY FAR ONE OF MY FAVORITE BALLS THAT USUALLY WILL COME OUT OF MY BAG ON A FRESH HOUSE SHOT OR MEDIUM PATTERNS THIS BALL IS VERY EASY TO READ WHEN IT DRIVES THROUGH OR LEAVING CORNERS EASY TO ADJUST BASED ON THE BALL AND ITS COVER..PLEASE GO PRE ORDER YOURS TODAY YOU WONT BE DISAPPOINTED! With the kinetic amethyst I was able to play multiple angles. I was bowling on Stone Street was able to play up the boards and get a little bit right being left handed and it still have enough energy to go through the pins. Pin is above rigner finger bout 1ich and kicked left bout 1/4 of inch. Cg is 1/2 above my center line and about 4inches from it. Impress on how many different angles I could play with this ball. To me it reads a little bit sooner than a kinetic Emerald and has the same hook if not just a bit more than a kinetic Ruby. this is actually probably the smoothest ball out of three. This is the cleanest, and most angular in the Kinetic line. Great response to surface adjustments and it fits well within the Kinetic group. If you found the Ruby Kinetic a little too early, this ball will clear the fronts better and give you the recovery to move in with the transition. Due to the time it takes to produce the Track Kinetic Amethyst ball it will ship in immediately. We cannot ship this ball outside the United States.